The What: Altinex is shipping three new USB Type-C connectivity products for use with the company’s Tilt ‘N Plug, Pop ‘N Plug, and Cable Nook interconnect boxes. The What Else: The new Altinex CM11380 incorporates a USB Type-C (socket) connector to a USB Type-A (plug) connector in a 6-foot cable assembly designed for Keystone snap-in compatibility. The CM11380 makes for convenient charging or data access when used, for example, with the popular Altinex TNP128 interconnect box, which supports a wide range of snap-in connectors. The Altinex CM11381 is a USB Type-C (socket) connector to USB Type-A (plug) 6-foot cable assembly with full support for the USB 3.0 specification. The panel mount USB Type-C cable is mounted into any D-sub location. Altinex’ online tabletop configurators are now offering this cable for units’ customization. Like the Altinex CM11380, the new CM11381 supports the USB 3.0 specification. As the latest addition to the Altinex RT300 Series of cable retractors, the new RT300-160 is envisioned for eliminating cable clutter. 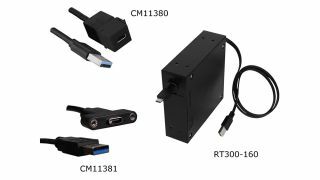 Designed for use with the Altinex CNK200, CNK221, and TNP530 interconnect boxes in addition to stand-alone applications, the new RT300-160 helps manage USB Type-C cables. Designed to provide optimum performance, the RT300-160 supports USB 2.0 and has 4 feet of retractable cable and 4 feet of fixed length cable. The cable and the retractor have been tested to more than 10,000 extensions/retractions. The AC200-125 and AC221-125 mounting hardware packages (sold separately) securely mount the RT300-160 into the CNK200 and CNK221 tabletop units. The Bottom Line: USB Type-C connectivity is becoming an essential part of portable smart devices and the introduction this new connectivity ushers in a new level of convenience and functionality within meeting spaces.